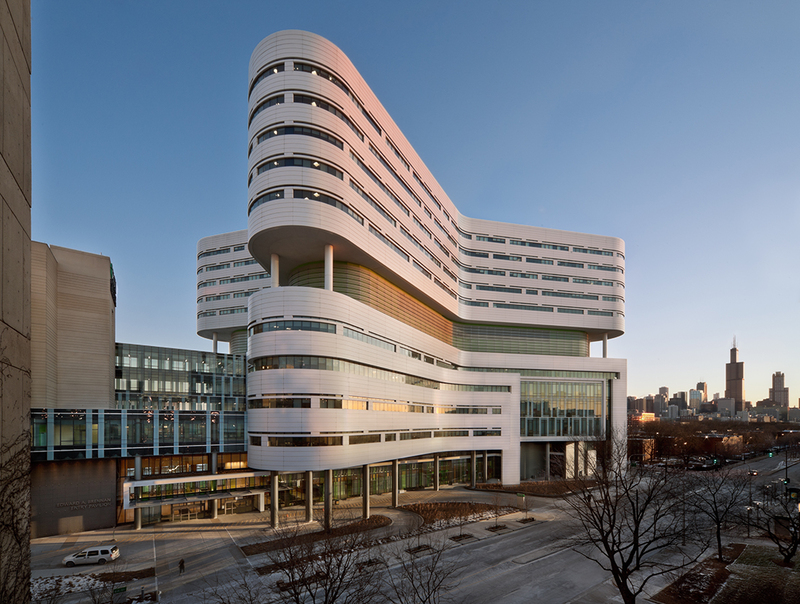 The design of Rush University Medical Center in Chicago, Illinois focused on reorienting the campus to the surrounding area, creating a more inviting presence for patients and families, and embodying the principals of sustainable design. 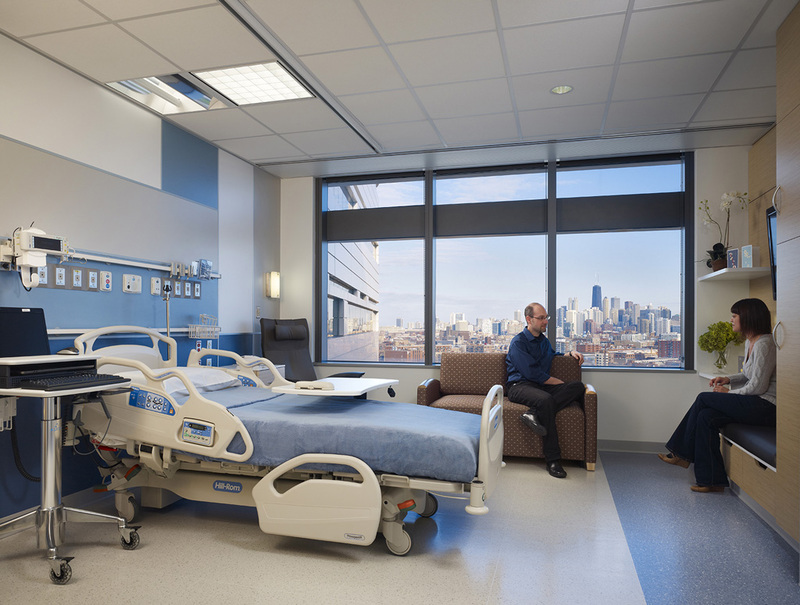 The hospital is part of a campus-wide transformation project which also includes an orthopedic building, a parking structure, and a new loading and delivery system. 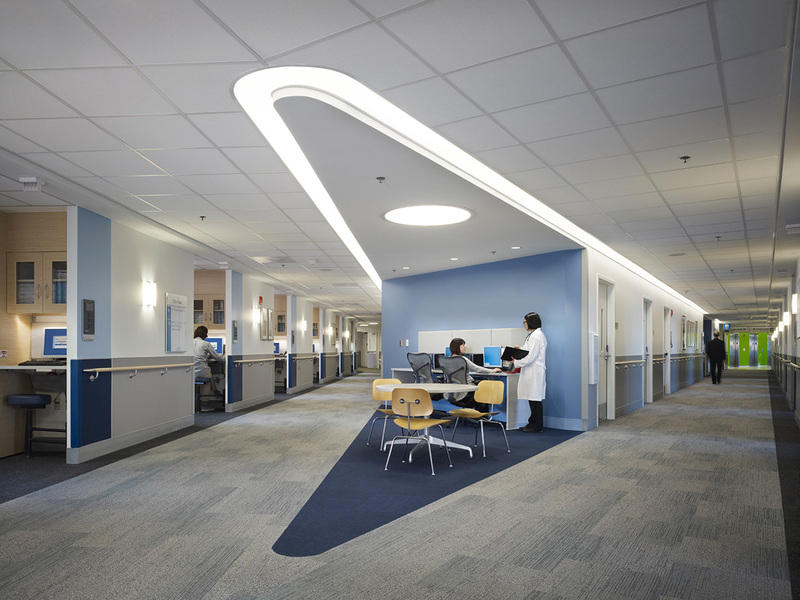 The 800,000 square foot hospital consists of 386 patient beds along with diagnostic and treatment facilities such as surgery, radiology, and emergency departments. 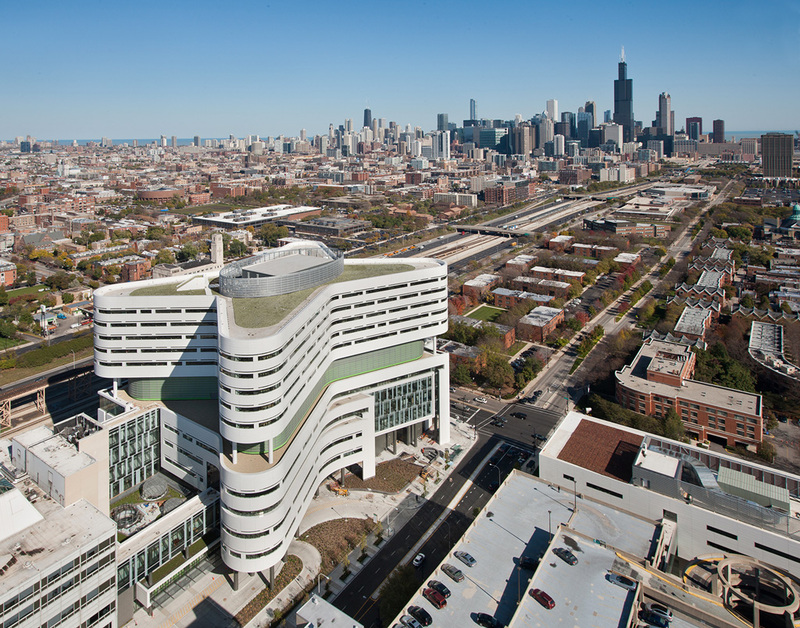 The organizational concept consists of a rectangular, six-story base containing new diagnostic and treatment facilities topped by a five-story curvilinear bed tower. The base connects to existing diagnostic treatment facilities to create a new continuous interventional platform.
. The more layered and scaled down south façade contains the public elements of the base such as lounges and waiting areas. 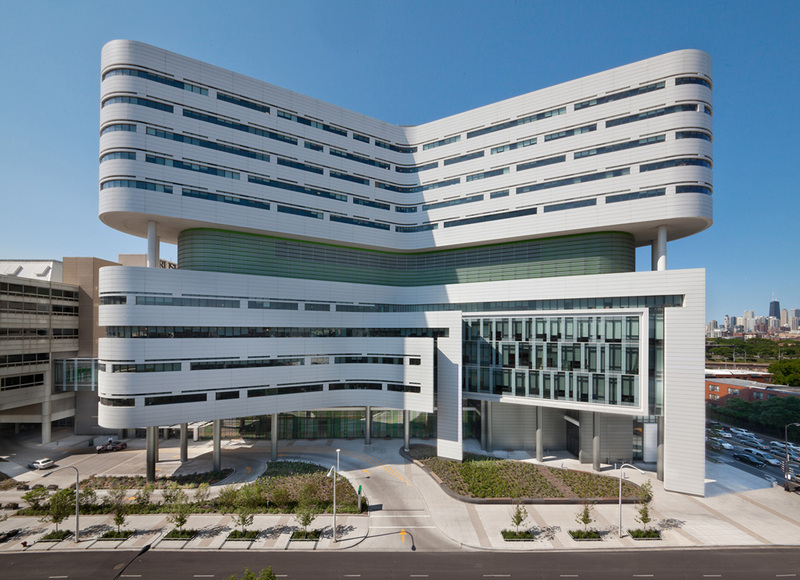 A 3-story volume between the new and existing hospital provides an entry at grade and an existing level four bridge to a parking structure. 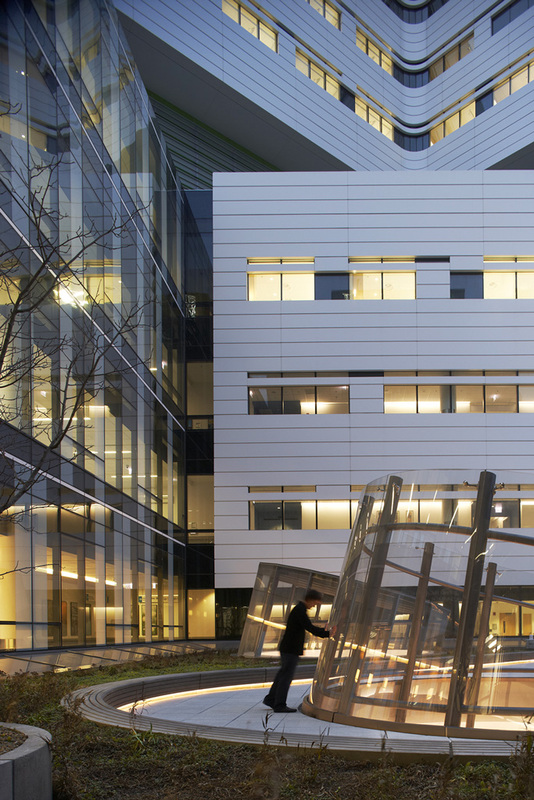 To establish a welcoming arrival experience on the ground plane, patients and families are greeted by gardens, benches, and a giant, airy public entrance. 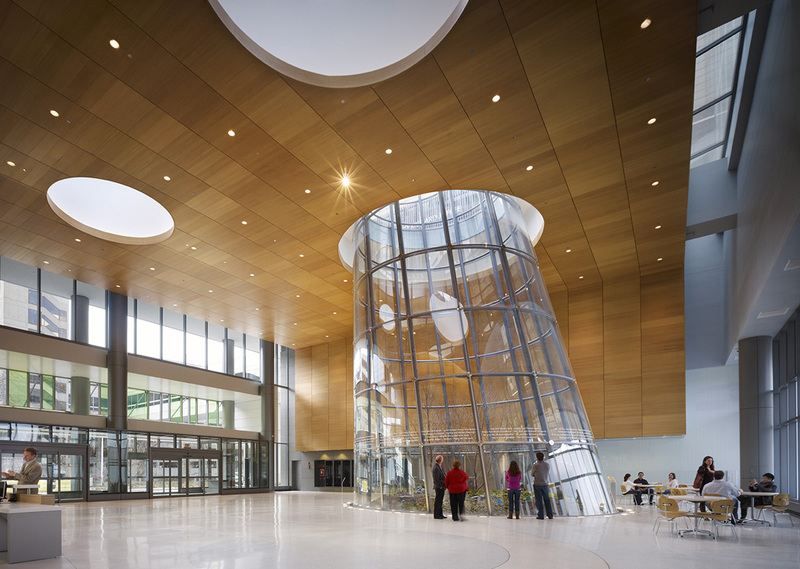 Inside the hospital, a unique 10,000-square-foot entry pavilion connects the new building with the existing hospital facility where patients and families are provided clear arrival and departure points within a space featuring soaring 34-foot ceilings, natural wood finishes, circular skylights, and a terrarium centerpiece that serves as a sculptural element and literally brings nature indoors. The centerpiece, open to the sky above, houses trees and plant life and allows sunlight, snow, and rain to filter in. 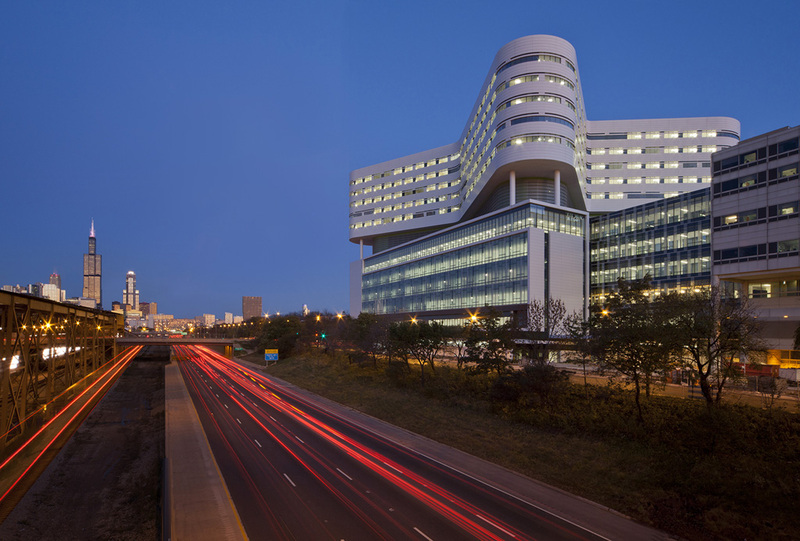 What it made it possible for Rush to become one of the largest LEED Gold-certified hospitals in the United States was a holistic, comprehensive approach of supporting and enhancing an overall environment of health and wellness. 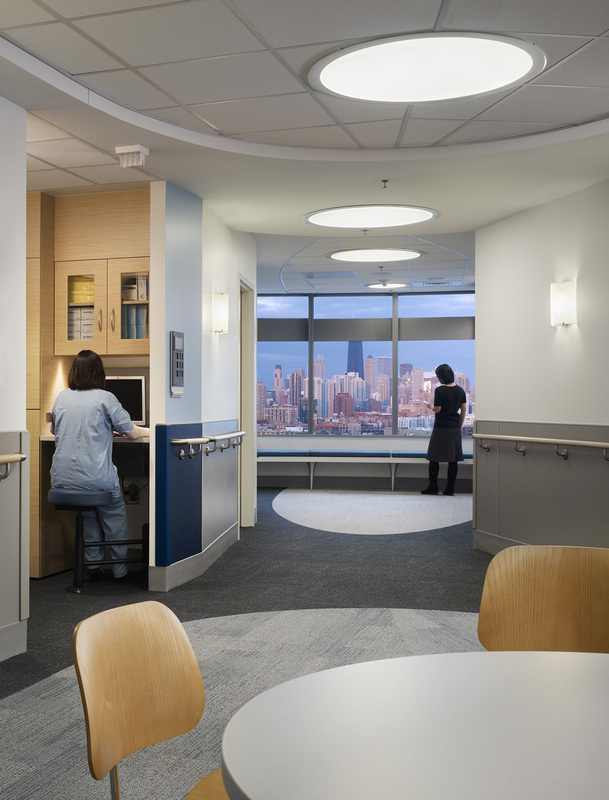 Structurally, seventy-seven percent of the hospital was constructed of recycled steel with regional and sustainable materials used throughout the interior. 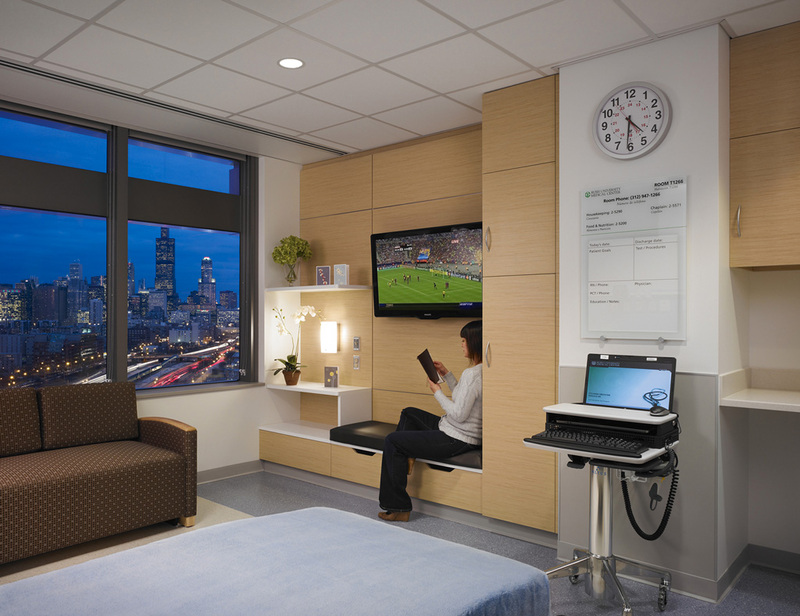 The hospital rooms are finished with low-VOC-emitting adhesives, sealants, paints, and flooring that contributed to the high indoor air quality with the building’s roof maximizing opportunities for green space to provide multiple environmental benefits beyond aesthetics: reduction of rainwater run-off, reduction of urban heat island effect, and increased thermal barrier. Several water conservation strategies are used in the design as well including a series of infiltration planters take advantage of the street’s natural slope, using curb cuts to allow street run-off to irrigate the street-side landscape. Additionally, condensate drip water from the mechanical units is collected in an underground cistern and used for landscape irrigation and recirculating mechanical make-up water, saving 1.3 million gallons of water per year. 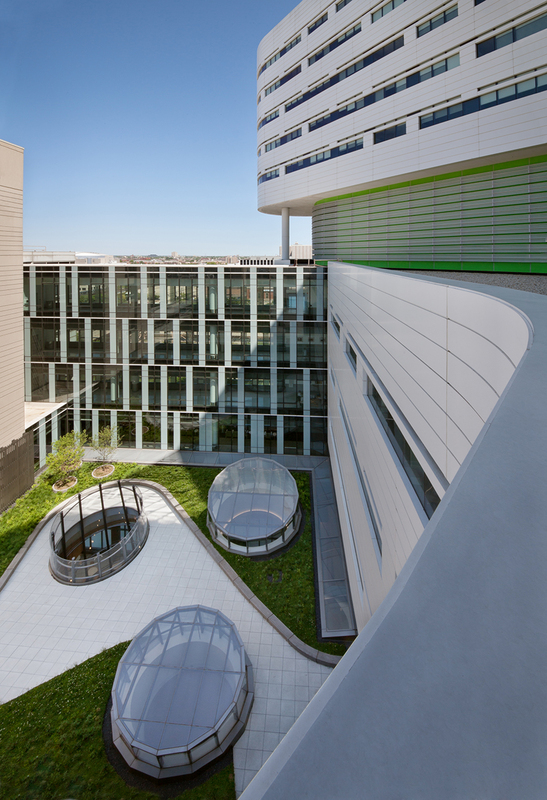 The Rush University Medical Center is an icon of health, wellness, safety, and sustainability, visualized by its unique form and articulated by the thoughtful, accommodating, and supportive healing spaces inside. with numerous awards, including national and regional Honor Awards from the American Institute of Architects. His work has been exhibited at the Art Institute of Chicago, the Paris Biennale and the Sao Paolo Biennale. He participated in Emerging Voices and Young Architects Forum by the Architectural League of New York. His design work has been published in Architectural Review, Architectural Record, A+U, Architect and Domus. He frequently lectures and has been a Visiting Critic at several universities. His memberships include Board of Overseers at Illinois Institute of Technology School of Architecture, Committee on Design Architecture of the Art Institute of Chicago, and Fellow of the American Institute of Architects.